“Searching! Yeah, I’m gone a-searching! Searching every which a-way. . . This is what you would have seen if you did a Google search for ‘frightened faces’ up until a day or so ago (glad I got the screen capture when I did, cuz’ she seems to have been recently replaced by a creepy painting of St.Anthony). I can’t begin to tell you incredibly amused I was by the fact that T’s silly scared face outranked that of good ol’ Harry Potter for over a year! WordPress keeps a log for me of how people find this site, and the top random searches that bring people here are for surprised, sad, and frightened faces. The images are from a post that dates back to 2009 (I can’t believe I’ve had this little blog up and running for two years!). 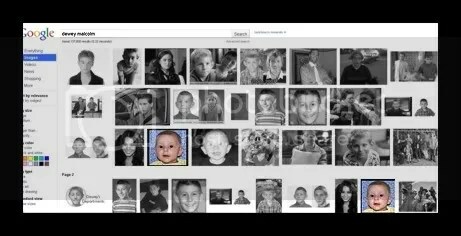 Next in line is an image search for Dewey Malcolm 2009 or Dewey Malcolm in the middle, where my little Dewdrop shows up a couple of times in the first few pages, leading people back to this post. The internet is a very odd and slightly silly place! I have to wonder if these people have found what they’re looking for. . . somehow I doubt it! Oh I love it!! Stars for real! Lil famous faces!! !I love it! It’s just a part of WordPress, I don’t know if Blogspot has this feature because I don’t use that site. . . but maybe you can check. On mine it’s under a tab titled ‘site stats,’ which tells me how many views I’ve had that day, week, month, year etc. and how they got there – if they clicked on a link on another blog, or got a link via e-mail or RSS, or did an internet search (no matter what search engine). I’m sure you have it somewhere in your dashboard! Good luck finding it!!! I would love to be a google star!